This work transcends political commentary and gesture in its exploration of how an ordinary, banal substance such as soil from foreign parts can gather ideological and mythical baggage. Vasseur makes an enduring impression, and his work sends broad messages — that art is but a box we fill with our own projections. It's a story that we choose either to believe or reject, and a smuggling act that calls for subversion, subtlety and surprise. 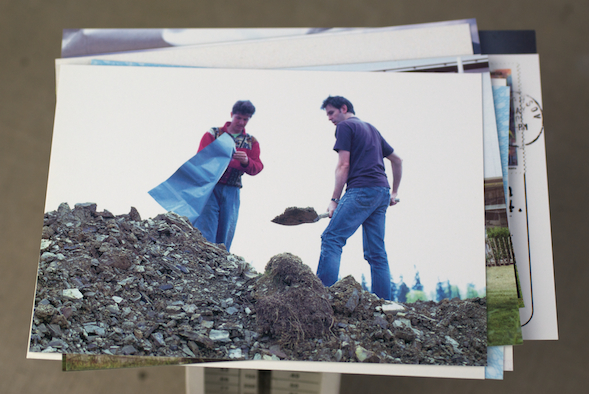 This publication documents the journey of 1 cubic metre of earth excavated form the Borgo Pass, Transylvania by Roman Vasseur. 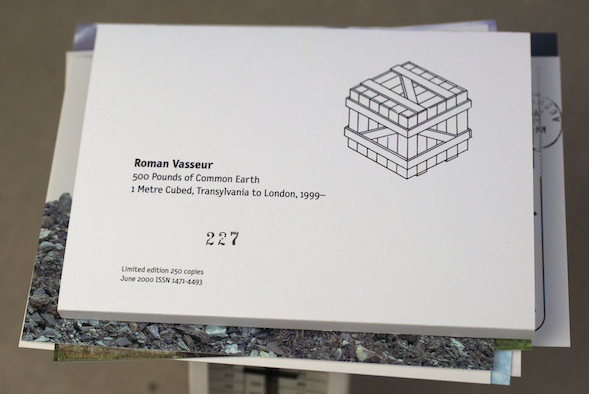 The earth was transported from its original location in Romania by land to Vienna, then to London, where it was installed at the Austrian Cultural Forum. The Earth progressed to Project in Dublin in 2001 and in 2002 appeared at Art Resources Transfer Inc. New York, before going on to Raid Projects, Los Angeles and finding its 'final' resting place at the Center for Land Use Interpretation in the Californian desert. This document brings together facsimiles of customs documents certifying the soil free of contamination, images of the journey, maps charting the route and postcards home.